We can make most items gluten free and never any MSG! Ban Thai restaurant is a traditional Thai restaurant located close to St. Paul and Minneapolis, Minnesota. The English translation of Ban Thai means Thai house. We wish to make everyone feel like they are eating fresh Thai food in a traditional Thai home in Thailand. The owner, Pornouma Marid was born in the small coastal town of Rayong on the Gulf of Thailand. Pornouma earned a business degree from Valaya Alongkorn Rajabbat University under the Thai Royal Patronage. 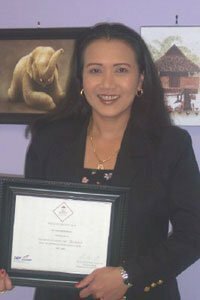 She worked as an export manager for a large Bangkok manufacture until she married her husband and came to the USA in 1997. She opened Ban Thai in White Bear Lake, Minnesota in 2005. The Marid family has owned and operated Thai restaurants for over 60 years. Most of Ban Thai’s delicious recipes are from the Marid family cookbook. Ban Thai’s recipes are made fresh on a per order basis with no MSG. This assures all of Ban Thai’s dishes to be fresh and delicious. Authentic Thai food incorporates a wide variety of fresh vegetables and Asian spices. Thai food is not always hot, rather there is an emphasis on wonderful flavors. But if you are one of the bold we can make it very spicy and “Thai Hot”. Ban Thai can prepare your meal at any level of spiciness. I hope you enjoy your dining experience at Ban Thai. The staff and I wish say a very special “Khop Khun Ka” which in Thai mean Thank You for dining with us and hope to see you again.